Most of the information in this article comes from the Bishop Museum publication HULA HISTORICAL PERSPECTIVES. Details of this book are listed in the Bibliography section. That hula has been part of Hawaiian culture since ancient times, perhaps even from before there were people living in the islands now called Hawaiian, is clear from the multiplicity of traditions about its origin. Various places, among them the islands of Hawai`i, Moloka`i, O`ahu, and Kaua`i claim to be hula’s birthplace, and link its beginnings to a number of gods and humans. Some claim that Hi`iaka’s friend Hopoe was the first dancer. Others call Kapo’ulakina’u the first divine patron of hula, or cite the long and beautiful story of Keaomelemele as the foundation myth of dance. Still others connect its origins with various forms of the pan-polynesian culture hero, the great navigator Laka/La’a/Lata. These tales represent the ancient people’s attempts to answer the question “Where did hula come from?” For that reason, efforts to decide which of these stories is “the correct one” are more or less a waste of effort. To some degree, all of these answers are correct; such is the nature of myth. A point about these stories that bears scrutiny is that most of them connect hula with goddesses. A modern myth, occasionally repeated in literature, holds that in ancient times only men danced hula. Not only is there no documentary evidence to support this contention (For example, James Cook, the first European to visit Hawai`i, records seeing women dance on Kaua`i in 1778. ), but the association by Hawaiians themselves of hula with goddesses argues against it. Like many polytheistic peoples, they generally endowed their gods with human attributes and jobs. The goddess Hina, for example, beats kapa just as a human woman would do. This makes it hard to believe that Hawaiians would have linked their ancient dances to female divinities if female humans were forbidden to perform them. Several of Cook’s crew wrote about hula performances, and the expedition artist John Webber drew a male dancer wearing what appear to be kupe’e made from dogs’ teeth, and using a single `uli`uli. These accounts are significant as the first and only records of hula made by outsiders at the time of first contact. With Cook’s arrival began an era of great and swift changes to Hawaiian culture. Not only did foreigners introduce material goods such as woven cloth, steel tools, and firearms, and social practices like sharing of food between men and women, but Hawaiians, descendants of some of world prehistory’s most accomplished seafarers, began travelling aboard European vessels and learning about the customs of other peoples. Perhaps no single event of this period reflects more visibly the changes wrought by foreign contact than the abolition of kapu after Kamehameha I`s death in 1819. From the time of its introduction by the Tahitian priest Pa`ao in about the thirteenth century C.E, kapu had been the primary control mechanism of Hawaiian society. In modern usage it generally means “forbidden”; for example, a sign bearing the word KAPU is a way of saying “No Trespassing”. While it does have this significance in ancient parlance, it also means “sacred” or “privileged”, and these definitions more accurately describe the kapu system. Underlying this concept of kapu is that of mana, spiritual power. All creation, including things moderns call inanimate, possesses mana, but some beings have more of it than others. Among humans, ali`i (chiefs), being more closely linked to gods than are people of lower rank, have more than maka`ainana (commoners), and males possess more than females. To be effective, each individual’s and each class’s mana must remain pure, unadulterated by another’s. Maintaining spiritual and geneaological purity was as much a concern for Hawaiians of this era as it has been for European royalty, orthodox Jews or Muslims,and the protocols they developed for this purpose were just as strict. For example, certain areas, such as Holoholoku in Wailua, Kaua`i, were off-limits to anyone of less than chiefly rank. Commoners caught trespassing in this precinct would be summarily put to death. Another well-known kapu reseved foods such as pork, certain varieties of red fish, and most types of banana for men only, and forbade the sexes to eat together. More than just a set of social conventions, kapu reflected the arrangement of the universe. As the gods kept order in the macrocosm, so their earthly counter-parts, the ali`i, kept order in human society. When ali`i enforced the kapu, society functioned harmoniously. If something went awry among the ali`i and kapu was breached, society broke down. Kamakau and other commentators have recorded that great social upheaval often followed the death of a powerful chief. During the interregnum, until a new ali`i asserted power by reinstalling the kapu, all manner of forbidden behaviour occurred. What happened in 1819 was that Kamehameha II, Kamehameha I’s heir, never reinstated the kapu after his father’s death. At the urging of his mother, Keopuolani, and the regent Ka`ahumanu, he proclaimed the ‘ai noa, or “free-eating”, and joined the royal ladies at a public banquet. This act changed Hawaiian society in many important ways. One of the most significant was that, because it occurred about six months before the first company of Protestant missionaries arrived, it facilitated conversion to Christianity. A common misrepresentation of history holds that the missionaries banned hula. While it is true that they openly disapproved of hula (and, indeed, other forms of dance) as both a licentious and idle pastime, they had not the authority to enact laws. In 1830, Ka`ahumanu, the queen regent and a convert to Christianity, issued an edict banning public hula performances, but this had little effect. Although it was apparently never formally rescinded, the law was so widely ignored, especially after Ka`ahumanu died in 1832, that it virtually ceased to exist. In 1836, for example, the French consul for Manila visited Honolulu, and attended a state banquet hosted by the king. Part of the festivities was a formal hula performance. With the accession of King David Kalakaua in 1874, hula once again went officially public. Both his 1883 coronation and his 1886 jubilee celebrations included performances of ancient and newly created dances. It was this patronage of King Kalakaua, the Merrie Monarch, that organizers of the modern festival of the same name wished to honor. Two years after Kalakaua’s death in 1891, his sister and successor Lili`uokalani was forced from the throne by a cabal of Honolulu businessmen conspiring with the United States minister to Hawai`i. With the end of the Hawaiian monarchy came the end of hula as part of official government protocol for almost a century. As it had done ever since its beginnings, hula continued to evolve during the nineteenth and twentieth centuries. From as early as 1865, the style called hula ku`i (joined hula), blending native and foreign elements, became popular. Urban Hawaiian society in the late nineteenth century was as cosmopolitan as it is today. Especially after steamship travel became common, people from many parts of the world came to the islands, and Hawaiians went voyaging. In the early 1880’s, for example, David Kalakaua became the first reigning monarch to circumnavigate the earth. His visit to the Emperor of Japan during this trip helped open Hawai`i to Japanese immigration,which officially began in 1885. Even those citizens of Hawai`i who did not travel eagerly followed and adopted the latest scientific and cultural trends of their day. European musicians like Henry Berger introduced melodies, dances, and even instruments from their countries. Hawaiian music and dance adopted and adapted many of these new elements, a trend which continues today in Jawaiian and other modern musical inventions. In the early twentieth century, Hollywood filmmakers “discovered” Hawai`i, adapting hula to their own purposes and fantasies. Many of the familiar hapa-haole (songs about Hawai`i composed wholly or partly in some haole (foreign) language, most commonly English) tunes like “My Little Grass Shack” and “Blue Hawai`i” date from the Hollywood era. In the early 1960’s, a group of Hilo businesspeople, wanting to attract tourists during the normally slow season of March-April, decided to organize a festival of local culture. On the advice of cultural practitioners concerned about the increasingly haole character of Hawaiian culture in general and of hula in particular, they instituted a hula competition. To distinguish their event from ordinary tourist shows, and to encourage performance of more “authentic” hula, they created categories of hula kahiko (ancient dances or modern ones in the ancient style) and hula auana (modern). Today this festival, named Merrie Monarch in honor of King David Kalakaua, is a major media event. It has also significantly influenced hula teaching and performance. Establishment of The Merrie Monarch competition coincided with a Pacific-wide revival of interest in oceanic cultures. The most visible and famous expressions of this resurgence were the voyages by canoes like Hokule`a and Hawai`iloa along the ancient oceanic highways that once connected Tahiti, Hawai`i, Rarotonga, Aotearoa, Tonga, Te Pito o Te Henua, and other polynesian islands. In the early twenty-first century, hula and Hawaiian culture continue to evolve and spread. Some of this has resulted from the Hawaiian diaspora that began in the eighteenth century with Hawaiians working aboard foreign ships, and has increased with the growth of modern transport and communications. Ethnic Hawaiians now live and raise families in North America, Europe, Australasia, and other regions of the world. The western United States, including Nevada, Washington, and California, are home to especially large multi-generational colonies of Hawaiians, many of whom proudly practice and display their culture as a way of asserting their connection to their ancestral homeland. 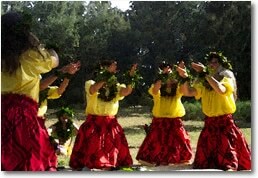 Thanks in part to them, people in Europe, Japan, Mexico, Canada, mainland USA, and other lands now study and dance hula. Such popularity brings its own array of challenges. Can hula retain its integrity as a distinctly Hawaiian practice while each new land and each new student contributes to its growth? Is it in danger of becoming assimilated with or absorbed into other cultures’ dance forms, and losing the very qualities that give it such great appeal? “Nana i ke kumu”, advises a famous Hawaiian proverb, “Pay attention to the source.” In hula this can bear the obvious meaning of “Watch what your teacher (kumu) does.” It also contains a more profound admonition not to lose sight of hula’s roots (kumu) in the ancient protocols of Hawai’i and Polynesia. If it loses this connection, hula can indeed become just one more style of dancing. How po`e hula (hula people) cope with this challenge will determine how hula develops in this century and centuries to come.